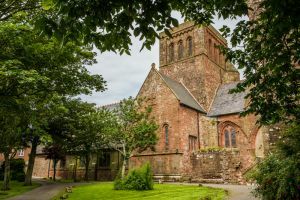 There is so much history and legend surrounding the priory church of St Mary and St Bega in the Cumbrian coastal village of St Bees that it is hard to know where to begin. The church is partly dedicated to Bega, an Irish princess who landed on the Cumbrian coast after feeling an unwelcome marriage. The traditional date of Bega's arrival in Cumbria is the 7th century, around the year 650. However, this is widely disputed, and an equally probably date is 300 years later, in the mid-10th century. Tradition, once again, suggests that Bega established a nunnery here, but it is equally likely that she lived simply as an anchorite, or hermit, before eventually moving on to Northumberland. 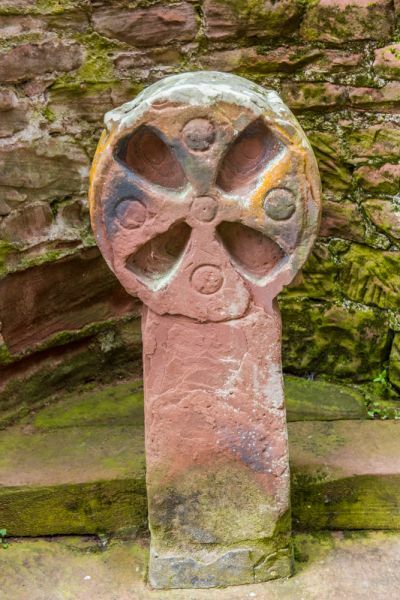 Sometime before 1120, long after Bega left, a Benedictine priory was established at St Bees on the site of an existing Saxon church. 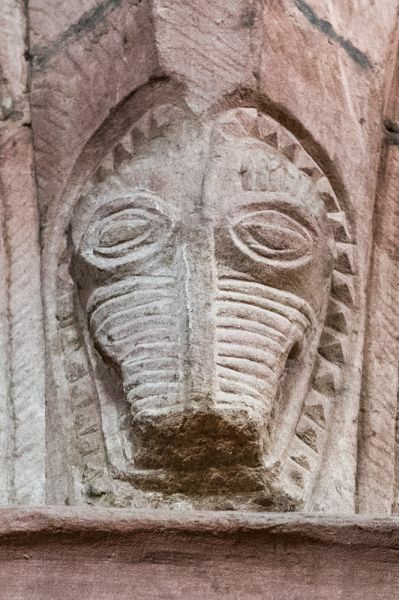 It has been suggested that the Saxon church was a minster, or mother church, for the whole Cumbrian region, though that seems far from certain. The priory lasted for over 400 years until it was dissolved by Henry VIII in 1539. When the priory was dissolved, the monastic church was retained to serve as the new parish church. 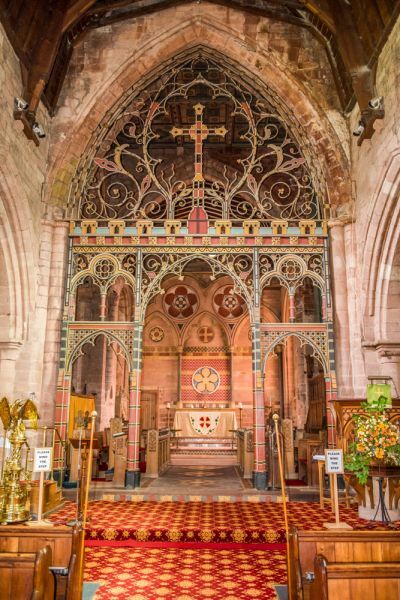 The Priory Church is a cruciform building, made of red sandstone, with a clerestoried nave, choir, transepts, Lady Chapel, and a central tower. The tower dates to about 1200, the nave to the years 1150-1220, while the Lady Chapel was added in the 15th century. If you look closely at the tower you can see that it was raised by 100 feet during a restoration in the 19th century. The most interesting feature of the exterior is probably the west doorway. This is a beautifully crafted doorway of 7 moulded layers, decorated with beakhead and chevron carvings, and lovely foliage carvings on the capitals. There is an ancient cross in the priory graveyard. This is much worn, but appears to date from the 9th century, and has Celtic style carvings. 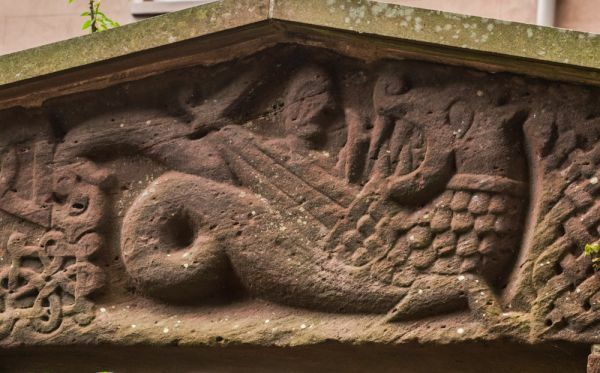 On a lintel between the church and the vicarage is the so-called Beowulf Stone, a beautifully carved stone depicting a knight slaying a dragon-like creature. The connection with Beowulf seems very tenuous, and it seems likely that the modern name 'Dragon Stone' is more accurate, as the image would appear to show a figure not unlike St Michael slaying the dragon; a familiar Norman theme. Perhaps it is both, a carving based on Norse legends of Sigurd, a sort of Scandinavian St Michael, merged with Christian tales of St Michael. 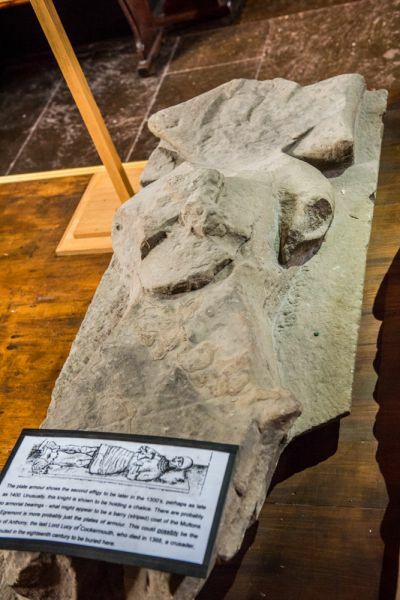 Within the church, at the east end of the south aisle, is a special heritage area, where another ancient cross shaft is on display, along with a collection of medieval stone effigies, 12th-century coffin lids and grave slabs, and other stonework rescued from the ruins of the medieval priory. 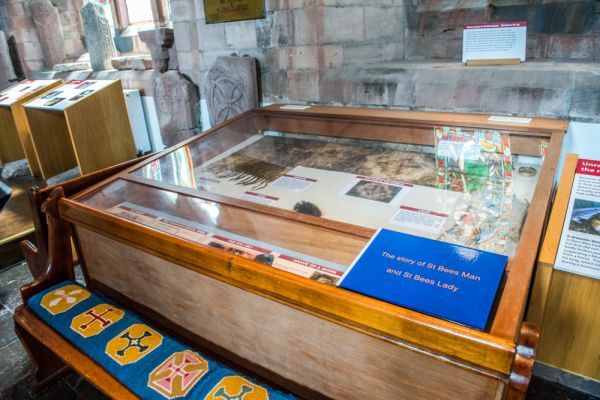 A special display tells the remarkable story of St Bees Man. In 1981 archaeologists opened a burial vault to discover a lead coffin. Inside the coffin, perfectly preserved by the lead encasing him, were the remains of a medieval knight in a shroud. So perfectly preserved was the knight's body that even the contents of his stomach were intact, along with his nails, hair, and skin. We do not know for certain who 'St Bees Man' was, but the most obvious candidate is Sir Anthony de Lucy, who died in 1368 while on Crusade in Lithuania. 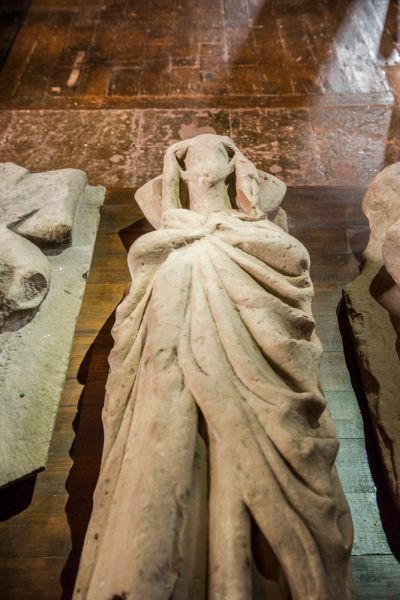 A display case exhibits the knight's effigy and shroud, as well as the effigy of a woman later buried beside him, thought to be Sir Anthony's sister Maud, who died in 1398. One of the amazing objects on display is the shroud that encased the knight's body. The shroud fabric is imprinted with the shape of the knight's face. You can't help but be reminded of the famous Shroud of Turin when seeing St Bees Man's shroud. In the grounds of the priory is a modern garden set aside to honour those who have lost young lives, either before after birth. The garden was set up according to the wishes of Josefina de Vasconcello and features touching statues, and quiet space for contemplation.